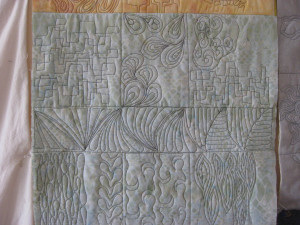 Free motion quilting adds depth, texture and artistic expression to an art quilt. For me, the focus on creating the art quilt itself is one process and the quilting of the quilt top is a different process. 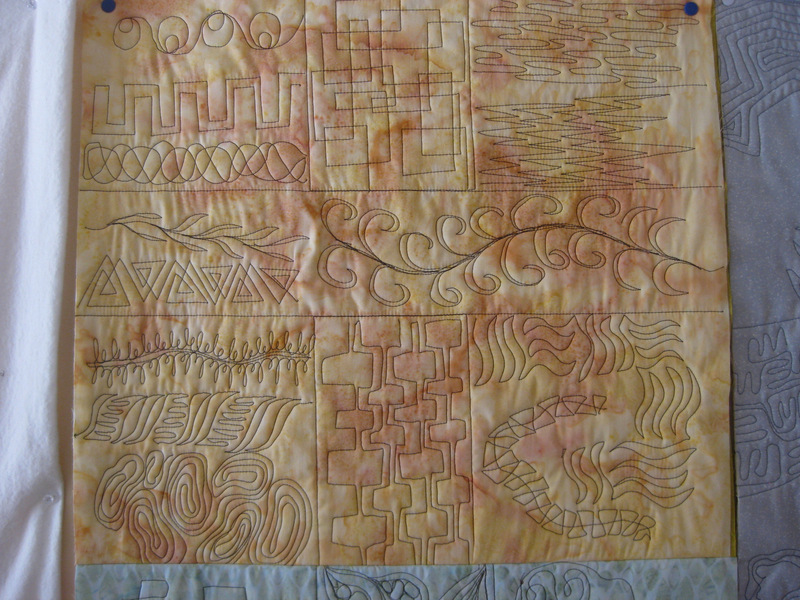 I rarely have any idea about quilt stitching when I’m designing and constructing the actual art quilt. Often I find myself making a half dozen art quilt “tops” because my head is focused on fabric, design, and sewing construction. 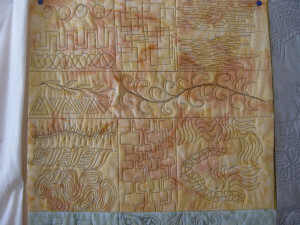 Then when the unfinished quilts begin to yell to be finished, I switch to a focus on quilt stitching. There are so many designs and ideas for free motion quilting that it can be overwhelming where to start. In a previous blog, about a year ago, I referenced the Free Motion Quilt Project on-line where hundreds of design ideas can be found. I have a board on Pinterest where I pin photos of free motion ideas I think I might like to try. 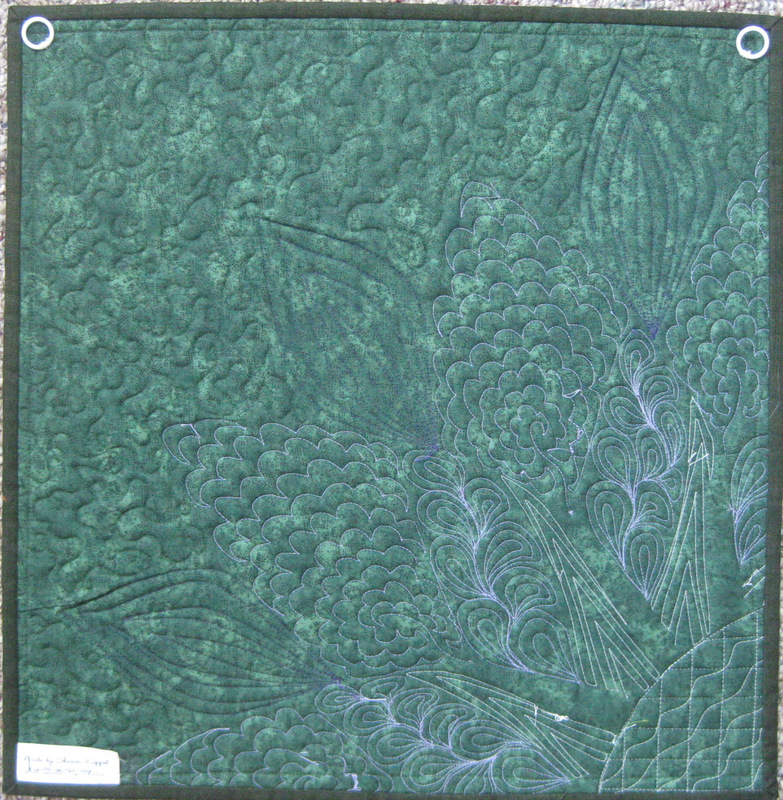 But the best source of ideas for me are some sampler practice quilts I have done and posted in my sewing studio. Every few months I make another sampler quilt which will have 9-12 different design ideas. These samplers are about 16″ x 18″. 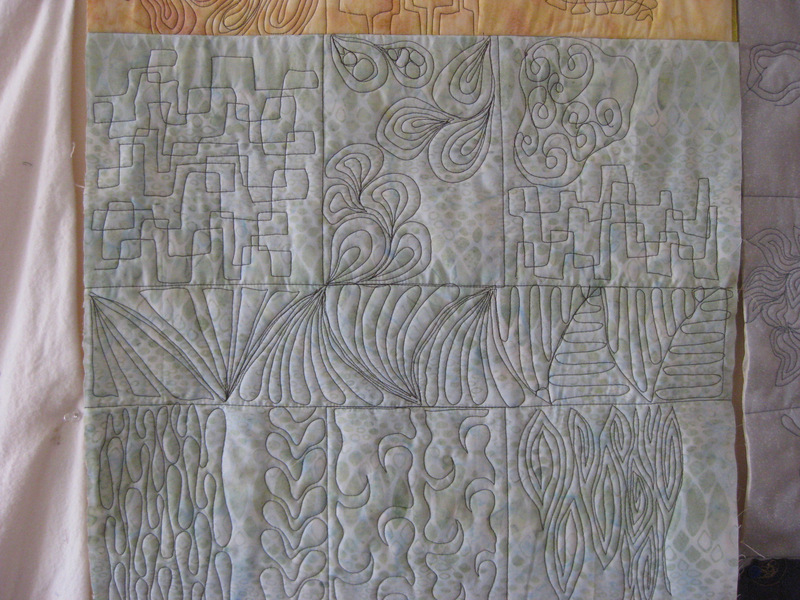 Right now I have five sampler free motion quilts hanging…it is about time for a new one! I’ve included photos of two of them. I always photograph the backs of my art quilts (See photo) which are included in the photos on my Etsy website. 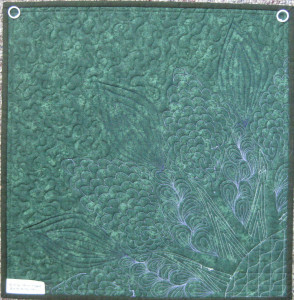 I have collected the photos o f quilt backs into an album in my Picasa so I can easily reference them for inspiration. It is easiest if the quilt is still hanging in my inventory…then I just retrieve it but often the quilt has been sold so high quality photos are the only resource. I didn’t realize until a year ago how important the photos of the backs of the quilts were! Before I begin to free motion quilt on a new art quilt I clean my sewing machine of all dust, lubricate it, and start with a new sharp needle. Then I practice on a scrap quilt. This is especially important if I’m doing a new design or a motion of stitching which I haven’t used often, OR, is a stitch I’ve sort of created on my own. The practice gets your “motion” in sync and helps you relax. Practice also lets you test your sewing machine to be sure everything is working well with whatever darning foot or stitch regular foot (as with Bernina’s) you are using.